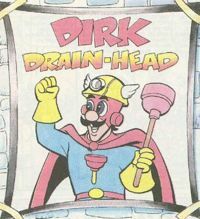 Dirk Drain-Head is a comic book superhero and is Mario's plumbing based idol in Valiant's Nintendo Comics System imprint. Aside from possessing various plumbing related weaponry, it is unknown what powers, if any, Dirk Drain-Head may possess; Dirk's origin is also relatively unknown. Dirk seems to be a stereotypical superhero, being honorable, virtuous, having a catch-phrase and a comedic sidekick, named Snakey; some of Dirk's enemies include Pipe Ooze, Muck and the mysterious Dark Dirk. Dirk is almost identical to Luigi in a appearance, likewise, Snakey resembles Mario. Despite his comic only coming out quarterly, Dirk Drain-Head has a large amount of comic issues, at 658. 1.1.1 "A Mouser in the Houser"
1.1.2 "The Adventures of Dirk Drain-Head"
1.1.4 "The Revenge of Pipe Ooze!" "A Mouser in the Houser"
Dirk Drain-Head was first mentioned by Mario in the issue "A Mouser in the Houser"; Mario, while traveling with Princess Toadstool through a Warp Pipe, mentions that he shouldn't have left his "Official Dirk Drain-Head Compass" at home. Princess Toadstool promptly tells Mario to be quiet about his obsession with Dirk. "The Adventures of Dirk Drain-Head"
Dirk Drain-Head was later mentioned in "The Adventures of Dirk Drain-Head", which gave somewhat more information on him. While being sent by the Princess to pick up the latest issue of her favorite comic book, Baroness Blue Blood, Mario rants about his fandom of Dirk to a reluctant Luigi, and asks some of the enemies for advice on where he could read his comic in peace. Luigi later admits that he and the others hate Dirk (Luigi's resemblance to Dirk creates an irony in Luigi hating the character) while battling the local Birdo, during which Mario loses the comic issue he was carrying. The enemies, being big fans of Dirk themselves, pick up the comic so they can read it. In the story "Bedtime for Drain-Head", it is revealed that Mario is so obsessed with Dirk Drain-Head that he often stays up for days reading his comics. Unfortunately, this oftentimes causes Mario to sleepwalk, believing himself to be Dirk Drain-Head. As "Bedtime for Drain-Head" showed, Mario would often go on adventures looking for Snakey in his "Dirk Drain-Head phase", often attacking any creatures that he came across. Oddly, while believing himself to be Dirk Drain-Head, Mario becomes several times more competent, easily beating several monsters, wrestling a Birdo to the ground and even subduing Bowser single-handedly. "The Revenge of Pipe Ooze!" "The Revenge of Pipe Ooze!" showed that Dirk, despite being a fictional character, is treated as a celebrity on Mushroom World, with an annual convention thrown in his honor every year in Pipe Land, complete with a large-scale role playing game. German Dirk Rohrkopf "Dirk Pipe-Head"
A brief mention of Dirk Drain-Head having a brother is made by Mario to Luigi ("Dirk drives his brother crazy too! "), but this brother is never seen. However, Dark Dirk is said to be his twin. Another plumbing-based hero of Mario's, called Mighty Plumber, would later appear in The Adventures of Super Mario Bros. 3 television series. This page was last edited on December 28, 2018, at 19:48.